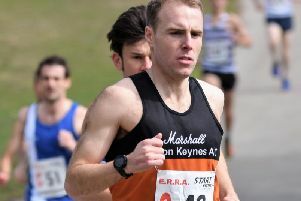 More than 1,700 athletes were in action at the MK Winter Half Marathon. Johnny Hay (Aldershot) won the race, but Redway Runners’ Neil Fairfield was first of the MK runners home in 72.54 in fourth. Top MMKAC athlete was Jamie Seddon and Graham Jones from MMKAC close behind. Both set personal bests as Jamie placed 6th(73.21) and Graham 7th(73.35) and the second and third best times in the MMKAC half-marathon rankings this year. In the top 100 for the Club and inside 90minutes were Stephen Young(15th/77.12), Gary Blaber(28th/79.00), Ian Wood(32nd/79.41), Tom Hayman(44th/82.20), Stuart Boyer(47th/82.49), Chris Dunn(80th/86.08) and Ross Wood(88th/87.12). From the 21 MMKAC finishers and inside 100 minutes were Casper Zoeftig (90.48), Simon Kirschner-Heavens set a PB of 91.14, Neil Jones clocked 92.41, Steve Martin 95.38, Jason Carvalho 96.31, Neill Boddington 97.52 and Mark Peterkin 99.20. Finally Victoria Kirschner-Heavens set a PB of 103.16, Julie Jones clocked 108.33, Peter Tye 115.59 and a PB by Nicole Boddington 131.27.